Helmholtz Zentrum Berlin strives to further develop accelerator technologies. The project »bERLinPro« should provide a new technological basis for a linear accelerator with energy recovery (Energy Recovery Linac). 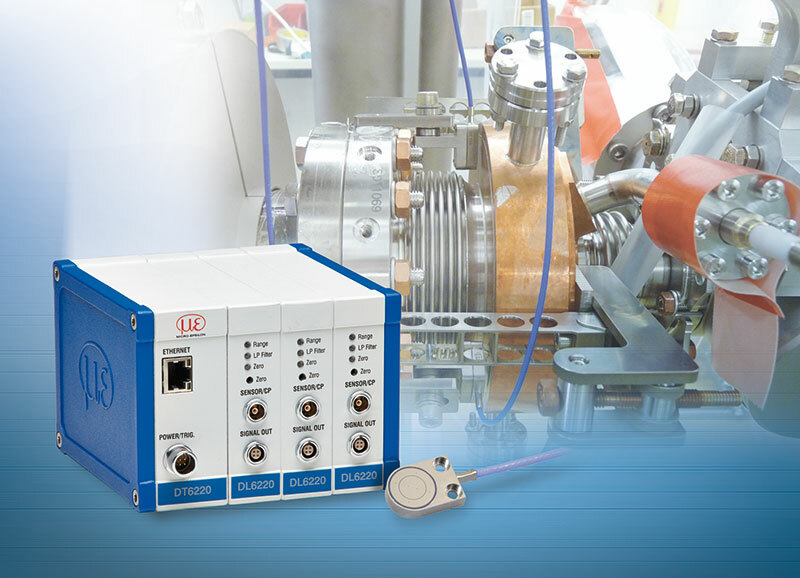 Helmholtz Zentrum Berlin relies for this purpose on Micro-Epsilon’s innovative measurement technology based on capacitive flat sensors with a modular capaNCDT 6220 multi-channel controller. This measuring system can be extended to up to four channels and is therefore suitable for flexible measurement tasks. In the process, the tilting and change of the holder’s position during cooling from room temperature to 2 Kelvin (-271 °C) is monitored. A photo cathode in a superconductive high-frequency electron gun is used to optimize the source of the electron bunches that are to be accelerated. During further acceleration, the electron bunches thereby generated remain more compact than bunches from other sources. This allows them to be used for achieving higher-quality X-rays, among other things. The requirements for the measuring system are challenging. However, due to its robustness, the capaNCDT 6220 capacitive measuring system is ideal for the harsh ambient conditions prevailing in this measurement task. Very low temperatures in the physical low limit range, ultra-high vacuum, x-ray bremsstrahlung and weak radio-frequency interference create harsh environmental conditions. Furthermore, the sensors from Micro-Epsilon fulfill the requirements with regard to sensor design, temperature resistance and long-term stability. For this measurement task, capacitive sensors with a measuring range of 4mm are used and a linearity of 10µm is required. The sensors achieve resolutions of 0.1µm. Thanks to the system's modular design, all three measuring locations can be captured with just one controller. Data output is via an Ethernet interface.